Welcome to the Village Sign Series! Village signs is a series of caches based on the ornate signs that depict the heritage, history and culture of the villages that put them up (normally on the village green!). The signs can be made of different materials from fibreglass to wood, from forged steel to stone. They can depict anything from local industry to historical events. The tradition probably stated in Norfolk or Suffolk and has now spread across most of the country. 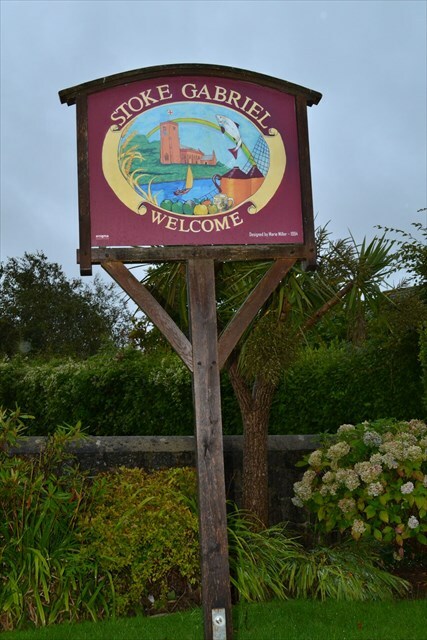 The village of Stoke Gabriel is in one of the most unspoilt parts of South Devon. It is situated on the banks of a small creek which is a tributary of the River Dart. Probably the first settlers at Stoke Gabriel would have been attracted by the salmon fishing on the Dart. The Parish Church of St Mary and St Gabriel is of Norman origin and in the churchyard the old yew is said to be over 1,000 years old. Legend has it that if you walk backwards around the tree seven times your wish will come true. Stoke Gabriel is well known for its mill pond and crab fishing on the tidal saltwater estuary. It has a population of little more than 1,200 and there is a local village shop, post office and tearoom. Amidst the quaint cottages which straggle along the sides of the valley there are two lovely old pubs, one of which was built to accommodate the masons who were employed in the area to build the local church. At that time the building also served as a courthouse and consequently the old stocks can still be seen just outside the pub. If anybody would like to expand the Village Sign Series please do. I would just ask that you let Smokeypugs know first at www.villagesignseries.co.uk so they can keep track of the Village Sign numbers and names to avoid duplication.